Archive of 2002 PNC Info. 12/28/02 - An article in the January 13, 2003 issue of Stamp Collector reports the existence of a 'No Die Cut' find of the non-denominated 37� Self-Adhesive U.S. Flag coil of 100. Steve Unkrich (see article below) was the lucky finder. Steve confirmed with me that the plate number is 1111. 12/26/02 - A new page has been added to the site featuring Test Coils with plate numbers. The material was supplied by Steve Unkrich. Access the new page either from the PNC Data bar or the Reference Bar or by clicking here. 12/20/02 - The 1� Tiffany Lamp coil stamp will be issued March 1, 2003 at the APS Ameristamp Expo in Biloxi, Mississippi. Two previous coil stamps, in new formats, have been announced. On February 4th in Washington we will see a New York Public Library Lion stamp in Lick 'n Stick coils of 500 and 3000. On March 19, the Sea Coast stamp will be issued in Washington in Lick 'n Stick coils of 500 and 10,000. No ceremony is planned on either. More details as they are released. 12/14/02 - Donna Rajotte in Providence, RI reports that she now has the 37� U.S. Flag coil of 100 with plate 4444 every 24 stamps. Item #780100. 12/13/02 - I've created a comparison page for the "G" and "H" stamps, and combined the pages for the 100 & 3000 Lick 'n Stick "H" coils. The comparison pages can be reached from a link near the bottom of the G and H data pages. 12/11/02 - We have received from Postal Service Headquarters a preliminary design for the 1� Tiffany Lamp coil stamp. The stamp will be issued in coils of 3000 and be part of the 'American Design' series. No issue date has been anounced. Click on the image for a larger scan. 12/8/02 - (Updated) According to an article in the December 16th issue of Linn's Stamp News, the 1� Tiffany Lamp coil stamp will not be issued February 28, 2003 at the APS Ameristamp Expo in Biloxi, Mississippi. I have confirmed with USPS Senior Community Relations Specialist Don Smeraldi that the issue date on the 1� Tiffany Lamp coil stamp has not yet been set. The stamp to be issued February 28th will be a $1.00 value. 12/4/02 - A couple of recent changes to the Dealer page (use Collecting PNCs bar) and additions of pictures on the Officers page (use Membership bar). 12/1/02 - The December 1999 issue of Coil Line is now online in the 'Reference' section. 11/26/02 - The results of our PNC3 auction #27 which ended October 26, 2002 are now posted online. All the auction information can be accessed by using the 'Membership' button, or by clicking here. Thanks to Auctioneer Joe Sedivy for another successful auction. 11/25/02 - Bob Rabinowitz has confirmed the existence of plate 4444 on the 37� U.S. Flag PSA coil of 100. 11/19/02 - Scott Publishing announced new catalog numbers for two recent coils. The Sea Coast stamp will have number 3693 and the 4 Snowmen receive 3680 to 3683. The snowman with the plate number is 3682. 11/13-16/02 - Two new definitive stamps for 2003 that could end up as coils were announced by the US Postal Service. One is a 1� Tiffany Lamp and the other is a 10� American Clock. Details as they become available. UPDATE: A reliable source indicates that the 1� Tiffany Lamp will be a water activated coil of 3000. The clock will probably be a sheet stamp. 11/11/02 - Philatelic Arts Publishing is soliciting articles and or exhibits for publication in next years 2003-04 Guide to Collecting Plate Number Coil Stamps. Of immediate interest is Flag Over Porch stamps and Transportation Coil Issues. If you have a recent article that you would like to have published that deals with these or any other area of PNC collecting or if you would like to have your exhibit pages published please contact Julian W. Jakubson at jwj@philatelicarts-pnc.com or write to Philatelic Arts, 370 Saw Mill Rd. Guilford, CT. 06437. I am beginning to prepare the 2003-04 edition of the Guide and would like to include your articles or exhibits for the benefit of all PNC Collectors. There will be a stipend sent for accepted work. Any article or exhibit not accepted will be returned to sender. Exhibit pages or illustrations used in any article may be in black and white or color. Please submit all work ASAP but no later than January 10th 2003. 11/9/02 - (posted by John Cropper) Brian Engler received an order from Kansas City containing coils of the 37� Snowmen Linerless Coil stamps WITH the USPS promised liners. The liner strips are long enough for strips of TWELVE to be mounted! 11/7/02 - Renate Fearonce in Tucson sent an email with the news that she has one 10k coil of the 3� Star. It has plate # S111 every 14 stamps, gummed, 5 digit pink top back #'s(low) and position 2. Down below the Archive links, I've added a 'frame' that contains links to two different Home Page setups. For those having problems with the high tech features on this page, you might want to try one of the alternatives below. Please send me any suggestions or let me know of any problems. 11/5/02 - Anthony P. "Tony" Willson of Santa Ana, CA, has been appointed as the new Regional Meeting Committee Chair for PNC3. Willson replaces John E. Peterson, now our Vice President, who held the post since 1998. Tony will also supervise the PNC3 slide programs. Donna Rajotte in Providence, RI reports that she now has the 5� Nondenominated Sea Coast 10k coil stamp. Plate number B111 every 20, black top and bottom back numbers every 10, position 5 only. USPS item number 781400. 11/3/02 - Welcome to the latest additions to our list of dealers. Victor Collinino does not have a web site, but is offering his lists by email in excel format or by mail. Stephen G. Esrati publishes a quarterly newsletter which includes his price list. Click here to access the dealer list. Any other member dealers that would like to be on the list, please send me an email. 11/2/02 - The November 1999 issue of Coil Line is now online in the 'Reference' section. 11/1/02 - Received an order today from Kansas City containing a coil of the 37� Snowmen Linerless Coil stamps WITHOUT the USPS promised liners. A Linerless 'Tape' survey card is being included with some coil purchases. I saw one on a pegboard inside a bubble pack. Click here for a scan provided by John Larson. 10/30/02 - The 37� Snowmen Linerless Coil stamps are in and scanned. In addition, there is a link for the 'stick' of 5 coils and the dispenser on the data page. Steve Esrati reports that Don Smeraldi of the U.S. Postal Service says the printing order for the tagged 5� Sea Coast stamp was a mistake and all reprints will be untagged. The initial supply of the Sea Coast stamp came out tagged. 10/29/02 - Through the courtesy of dealer Craig Selig, I have added additional scans of color varieties. The first is the 'Black Trees' on the 25� Flag over Yosemite. The other is the 'Bronx Blue'on the 32� Ferryboat. Click on the above links and then go to 'varieties' at the bottom of the page. Renate Fearonce in Tucson sent an email stating that she found some 37� Antique Toys PSA coils of 100 with plate B11111. She also now has in stock the 37� Snowmen Linerless Coil in coils of 100 and 'sticks' of 5 attached coils. Renate said she would sell strips as long as her liners hold out or if you send liners with your order. Check her recent emails by clicking on her name above. 10/28/02 - Today is the First Day of Issue for the 37� Snowmen Linerless Coils. 10/26/02 - A PNC3 member, Gil Mattox, wrote to inform me that the site was missing the listing for the Flag over Capitol, Scott #2115c. He reports that the plate number found on the 'Black field of stars' was #8. That information has been added. A comparison scan is online. 10/25/02 - Donna Rajotte in Providence, RI checks in to report that she has the 37� Linerless Snowmen coil of 100 in stock. The First Day of Issue is Monday, October 28. Click on the link for her latest email. 10/23/02 - Because of an incredibly quick turn-around from Renate Fearonce in Tucson, we are able to post the first images anywhere of the 5� Nondenominated Sea Coast coil stamp issued Monday and on-sale nationwide yesterday. These stamps were issued in coils of 10, 000. Plate number is every 20 stamps and the back number is every 10 stamps. Through the courtesy of dealer Craig Selig, I have added scans of color varieties on two stamps. The first is the 'Indigo Blue' on the 29� Flag over Whitehouse. The other, the 20� Flag over Supreme Court has two color varieties added: 'Slate Blue' and 'Brick Red'. Click on the above links and then go to 'varieties' at the bottom of the page. 10/22/02 - Donna Rajotte in Providence, RI writes to report that she does not yet have the Sea Coast coil, BUT she does have plate number 3333 on the 37� U.S. Flag PSA coil of 100, which is the first report of this new number. The plate number is every 24 stamps and the USPS item number is 780100. All the affected lists have been updated. 10/21/02 - Today is the First Day of Issue for the 5� Non-denominated Sea Coast (Seacoast) stamp. It was issued in Washington, DC in coils of 10,000 without a ceremony. Renate Fearonce reports that Tucson received the 5� Seacoast coil. It has plate #B111 every 20 stamps. She has two 10K coils with bottom back numbers, which are every 10 stamps. It appears that the back number is in position 5, or two to the right of every plate number. 10/19/02 - A few people report having problems with the 'page tour' using Netscape. Apparently the computer locks up after clicking the help button and they need to re-boot. A redirect to a Netscape friendly page, without the help icon, is in the banner above. For future reference, the page URL is www.pnc3.org/Default-netscape.htm. A reminder that the PNC3 Auction closes next Saturday, October 26. Click on the Membership bar to access the auction. 10/17/02 - The USPS announced today a long list of stamps being withdrawn from regular sale on October 31 and from Stamp Fulfillment Services on December 31, 2002. The list includes many coils. 10/10/02 - Jay Bigalke of the Virtual Stamp Club provides the first image of the 37� Snowmen linerless coil stamp. Click here to see the image. 10/6/02 - Updated - Dealer Steve Esrati today (10/3) pledged to rebate $20.00 of the $25.00 his customers paid for the reverse die cut Atlas. Add Mike Lipson, Jim Nelson and Teresa Wajek to the list of those dealers who promised a rebate to their customers. 10/4/02 - With a lot of John Cropper's help, I've added a 'toy' to the banner at the top of the site. Click on the book with the '?' mark. It may run slow, or not at all, on some machines, but I think that you will enjoy it. I had a great time setting it up. In addition, it will give you a different set of stamps in the upper right corner. 10/3/02 - Today's Postal Bulletin carried an article on the testing and selling of the 37� Snowmen 'Tape Stamps'. A tape dispenser will be available for an extra $1. Click here to read the article. Dealer Steve Esrati today pledged to rebate $20.00 of the $25.00 his customers paid for the reverse die cut Atlas. Click here to read the email. 10/2/02 - The USA Philatelic catalog, which arrived today, states about the 37� Snowmen 'Linerless Tape Coil Stamp of 100' to be issued 10/28: "Snowmen are the first issue available as tape stamps"... "Linerless coil test can be used in any tape dispenser". Renate Fearonce in Tucson reports: "I have one 10K coil of the Atlas PP/VV, with access to another. This coil has bottom back numbers." A PNC3 Regional Meeting will be held at SESCAL Saturday, October 5 at the Radisson Hotel, 6225 W. Century Blvd., near Los Angeles International Airport. The meeting will be at 12 noon in California Room B. Bill McMurray's "Tomorrow's Classics" Exhibit (U.S. Flag & Transportation Coils of 1981) is entered in the Philadelphia Stamp Expo October 11 and 12. 10/1/02 - Both Renate Fearonce in Tucson and Donna Rajotte in Providence sent emails with updated information on new items available. Renate also sent a new inventory and Donna has hers on the Providence web site. Access both from the 'Online Resources' section. Looking for a 10� Atlas with reverse die cuts? Some dealer prices are as low as $10.00 for a Plate number strip of 5. 9/30/02 - The October 1999 issue of Coil Line is now online in the 'Reference' section. 9/21/02 - In September 2002, the PNC3 web site received the "Golden Web Award" for 2002-2003 from the International Association of Webmasters and Designers 'In recognition of creativity, integrity and excellence on the Web'. The award icon is at the bottom of the page. As a result, our site will be listed in the "Who's Who on the Web". 9/20/02 - Tentative technical data has arrived from the USPS on the 5� Sea Coast S/A coil stamp of 10,000. Data on this stamp and the 37� Snowmen linerless coil have been added to all lists. 9/19/02 - Scott Publishing made it official today. The 37� Official Mail Coil stamp has been assigned catalog number O159. 9/13/02 - Auction Director Joe Sedivy has the lots for PNC3 Auction #27 posted. The auction ends October 26 and you must be a member to bid. Click here for the lots in Works or here for Word format and here for the bid form, or go to the 'Membership' bar for past auctions. 9/9/02 - (Updated) Received a report of plate 2222 on the PSA 37c US Flag coil of 100. Looking for confirmation. Number confirmed by Ken Cherry, new PNC3 officer. All lists have been updated. 9/5/02 - Technical details on the 37� Snowmen Linerless coil of 100 that appeared in the Postal Bulletin issued today are included in a data page. The coil with 4 designs is to be issued October 28. 9/3/02 - Donna Rajotte in Providence, RI sent word that she has the 23� Washington Reprint PSA coil of 100 with plate V22 in both Valley/Peak and Peak/Valley die cuts. The USPS Item # is 772000 and the plate number is every 11 stamps. 9/2/02 - (Updated) Two PNC dealers, Jim Nelson and Bob Rabinowitz, have reported finding mint quantities of the Reverse Die Cut 10� Atlas coil. Mike Lipson and Stephen Esrati also have them available for sale. 9/1/02 - The following newly elected officers of PNC3 took office today: President, Frank Covey; Vice President, John Peterson; Treasurer, Andrew Jakes; Secretary, Tom McFarland; Members at Large, Ken Cherry and Scott Adams. Gene Trinks will serve as Immediate Past President. 8/31/02 - The September 1999 issue of Coil Line is now online in the 'Reference' section. 8/29/02 - A friend of a member has made some album pages for used PNC's. They are in Adobe pdf format and are free for downloading. Click here to go to the pages. 8/26/02 - (Updated) The Postal Service announced today the upcoming issuance of a 5� Non-denominated Seacoast stamp to replace the 5� Wetlands. The first day will be in Washington, DC on October 21. No ceremony is planned. More details as they develop. A revised digital image with straight edges, top and bottom, was supplied today (4th) by the Postal Service. Click on the image for a larger, more detailed picture. 8/21/02 - Scott Publishing today assigned catalog numbers to recent coils. #3615 goes to the 3� Star. The Antique Toys were assigned the following numbers: Locomotive #3638; Mail Wagon #3639; Fire Pumper #3640; Taxicab #3641. A strip of 4 is #3641a. The plate number is only on the Fire Pumper stamp. 8/19/02 - A new plate number, V22 on the 23� George Washington was found by our Treasurer Tom McFarland at Stampshow 2002 in Atlantic City, NJ. The coil was found with both P/V and V/P die cuts. Click here for a comparison scan. It was brought to my attention that the auction pages were missing from the April, 1990 online edition of Coil Line. That has been corrected. The USPS announced in a press conference at Stampshow that present plans provide for strips of backing paper for those purchasing the 37� Snowman linerless coils of 100 from Kansas City. Seven backing strips, which will hold a strip of 12 stamps, will be included with each coil of 100. The first day is scheduled for October 28. Donna Rajotte in Providence, RI sent word that she has the 5� Wetlands with Plate 6666 and the 10� Lion with Plate S33333 in stock. Go to the 'Online Resources' Bar on the left or click here for details on this and other items received while I was in Atlantic City. All the appropriate lists have been updated to reflect the new Wetlands plate number. 8/13/02 - Renate Fearonce, the Tucson, AZ philatelic clerk, sent an update on new items received. Go to the 'Online Resources' Bar on the left or click here. Unless something major happens, I'm off to the APS show and our annual PNC3 meeting in Atlantic City. I hope to meet many of you there. Be back next Monday. 8/12/02 - The PNC3 web site was honored with the award of a "3 Star Site" at the Philakorea 2002 World Stamp Exhibition held in Seoul, Korea, August 2 to 11, 2002. This is an upgrade from the 2 star award we received last year. 8/11/02 - Members Andy Short and Ray Beer both sent new information. Andy reports that he found another used example of the 10� Atlas reverse die cut, this time on cover with a cancel. Click here for scans of both finds. Ray reports that he has examples of the 5� reprinted Wetlands with large perforation holes. The data page has been updated to include this information. 8/10/02 - My order for the 37� Official Mail coil of 100 arrived today. The stamp has been scanned and the data page updated. A surprise is that the paper is pre-phosphored, contrary to the announcement in the Postal Bulletin that they would be untagged. 8/10/02 - The data page for the 5� Water-activated Wetlands coil has been updated with information on the coil of 3000 reprint, which is listed in the Fall 2002 USA Philatelic catalog on page 25. 8/7/02 - The two 1� Omnibus issues, Scott # 1897 and 2225 have been split into separate pages and the information consolidated. Thanks to Peter Hoffman for the nudge. 8/2/02 - Linn's Stamp News announced that the 37� Official Mail coil issued today will be available from the 'cave' in Kansas City in Strips of 25 with a plate number. The item/order number is 780830. 8/1/02 - Another updated list of new items received from Donna Rajotte in Providence. Jim Bakehorn, the philatelic clerk in Fort Wayne, IN now has the 3� Star with back numbers in positions 1, 3, & 5 both tops and bottoms. He also has the 37� Flag SA coils with gap printed by BCA. The August 1999 issue of Coil Line is now online in the 'Reference' section. A scan was added of the 37� SA US Flag coil of 100. 7/30/02 - A closer check of the stock today at the Ft. Wayne office revealed that the Antique Toys coils are plate # B12222. For now, there are no reports of all 2s being found elsewhere. 7/30/02 - Bob Rabinowitz has reported that a bulk mailer received a shipment of 10� Lions coils with plate # S33333. All lists have been updated with the new number. 7/29/02 - Jim Nelson send a strip of the 3� Star which has been scanned. Mine are still in the back-order pile in Kansas City. Thanks Jim. 7/29/02 - The following are the newly elected officers of PNC3: President, Frank Covey; Vice President, John Peterson; Treasurer, Andrew Jakes; Secretary, Tom McFarland; Members at Large, Ken Cherry and Scott Adams. Their terms begin September 1, 2002. 7/27/02 - The 37� Antique Toys coils are in and scanned. 3 (perhaps only 2 - see 7/25 below) plate number combinations have been reported. 7/26/02 - PNC3 member Andy Short reports that he found a used example of the reverse die cut Atlas stamp. Click here for a scan. 7/25/02 - Richard Nazar reports that a response to a Freedom of Information Act request that he submitted to the BEP shows a new cylinder combination (6666) was used to print the (5�) Wetlands self-adhesive coil stamp (Scott 3207A). This cylinder combination was not previously used and has not been reported as having been found by collectors or dealers as yet. Click here for details. 7/25/02 - (Updated) On the eve of the first day of issue of the 37� Antique Toys coil of 100, three plate number combinations have been reported. B11111 is in Tucson, AZ and should be widely available, B12222 in Providence, RI and B22222 in Ft. Wayne, IN. New Information casts doubt on the existence of B22222. Can anyone verify this number? PNC3 dealer Jim Nelson reports he has received a supply of the 3� Star with plate number S111 and pink back numbers. 7/24/02 - Both Renate Fearonce in Tucson, AZ and Donna Rajotte in Providence, RI sent an update on new items received. Go to the 'Online Resources' Bar on the left or click here. 7/22/02 - Scott Publishing assigned catalog numbers to several recent coils. Number 3617 goes to the 23� George Washington self-adhesive coil of 100. The 37� non-denominated Flag coil receives # 3622. The 37� denominated water-activated Flag coil of 100 and larger both get # 3631. The 37� denominated Flag self-adhesive coil of 100 with 9.8 vertical die cuts is assigned # 3632, while the same stamp in larger coils with 8.4 vertical die cuts is # 3633. All of the affected charts have been updated to reflect the new numbers. 7/11/02 - The Postal Bulletin issued today announced that the 37� Official Mail coil of 100 to be issued August 2nd WILL have plate numbers. I have confirmed this with Don Smeraldi, USPS Senior Community Relations Specialist. 7/10/02 - The 10� Atlas data page has been updated and includes a 'computer generated image' of the reverse die-cut. So far, no mint examples have been reported. 7/10/02 - Donna Rajotte in Providence, RI sent an update on new items received. Go to the 'Online Resources' Bar on the left or click Providence. 7/8/02 - I've updated the 18� Washington data page and related checklists with new information concerning the tagged error. Added a new number and changed the notes. 7/7/02 - Received a report that the 23� George Washington coil exists with both P/V and V/P die-cuts. The recent 10� Atlas coil has been reported with reversed die-cuts: either 9 or 10 peaks on the left. 7/1/02 - The July 1999 issue of Coil Line is now online in the 'Reference' section. 6/28/02 - Renate Fearonce in Tucson, AZ sent an email with an update on new items received plus a copy of her latest inventory list in excel format. Go to the 'Online Resources' Bar on the left for her email and the Inventory List or click Tucson and Providence for either or both. 6/27/02 - Information on the 37� Antique Toys SA coil of 100 to be issued July 26 in Rochester, NY has been updated from the Postal Bulletin issued today. Click here for a First Day Cover offer from the Rochester Philatelic Association. 6/25/02 - Controversial plate # 1141 on the 33� Nondenominated "H" SA coil of 100 has been added to the appropriate lists. 6/24/02 - (Updated) Another New Die Cutting Omitted error has closed on Ebay. There were two lots, 1360998075 (sold for $66.00) and 1360998378 (sold for $305.00). One is a strip of 3 and the other is a plate number strip of 5 of the 34� SA Statue of Liberty with plate 5555. The auction description lists the Scott number as 3466. It probably is 3477. All of the affected charts have been updated to reflect the new find. 6/21/02 - Scott Publishing assigned catalog number 3612 to the 5� American Toleware coil. All of the lists have been changed. Scans have been added for the 37� WA US Flag coil of 3000, the 37� SA US Flag coil of 10,000 and the 23� SA George Washington reprint. 6/20/02 - (Updated) A 3k roll of the 37� WA US Flag has surfaced in the Redlands, CA philatelic office. It is providing # on # hits every 70 stamps with top pink (red) back numbers. Gay, the philatelic clerk at Long Beach, CA reports she has positions 2 and 4, top only, on the 5� American Toleware coil of 10k. Contact Gay at 562-628-1303. 6/18/02 - Donna Rajotti in Providence, RI reports that she has plate #2222 on the Nondenominated (37�) US Flag SA coil of 100 and the denominated SA coil of 10,000 with plate B1111 every 20 stamps. Back numbers are black top and bottom every 10 stamps. Go to the 'Online Resources' Bar on the left for her email and the Inventory List of both Tucson and Providence. 6/14/02 - US Postal officials announced today that the First Day of Issue for the 37� Antique Toys has been changed to July 26. 6/13/02 - (Updated) Plate #2222 on the Nondenominated (37�) US Flag SA coil of 100 and plate 55555 on the SA 25� Diner have been located at the philatelic office in Tucson, AZ. The 55555 is also now available in Providence. All of the affected charts have been updated. A link has been added to the 'Online Resources' Bar on the left for the Inventory List at both Tucson and Providence. 6/10/02 - Received the 5� American Toleware coil stamp today from Providence, RI. Click on the photo to go to the data page. Providence has positions 1, 3 (# on #) and 5 on the same coil. The philatelic window in Long Beach, California has positions 2 and 4. The positions repeat every 70 stamps. 6/7/02 - (Updated) Today is the first day of issue for the Nondenominated U.S. Flag shown here. It should be available nationwide. Click on the photo to go to the data page. Please note that many people are reporting that the die cuts on this issue are badly centered. Check yours when you purchase them. 6/5/02 - (Updated) I've developed a plate number / back number relationship chart to determine where the back numbers are in relation to the plate numbers in an 'open coil' or those still inside a vending machine. I'm looking for feedback to make sure it is correct. I've posted 2 links, one in Excel 2002 and another in Older Excel formats. I also did the same with other Excel files. Please let me know if you have problems. The chart has been posted to the web site in the 'Reference' section in Excel spreadsheet format. 5/31/02 - Countdown to an important happening - 10 ... 9 ... 8 ... 7 ... 6 ... 5 ... 4 ... 3 ... 2 ... 1 ... LIFT-OFF. The 'U.S. PNC Stamp Values' (formerly PNC Trends) feature is published in the issue of Linn's dated June 10, 2002. The data also has been posted to the web site in the 'Reference' section in Excel spreadsheet format. 5/30/02 - The scanning of back issues of Coil Line has been completed. Every issue up through June 1999 is now online in the 'Reference' section. In the future we will be adding one issue each month. 5/29/02 - The United States Postal Service announced today that several new 23� George Washington items will be released on June 7 in Washington, DC. One of these is a Self-Adhesive coil of 100 printed by Avery Dennison with a V11 plate number. The USPS ordering number is 772041. Known details are posted. 5/18/02 - The US Booklets bar has been activated. There is a lot of information already online, but a lot of work still needs to be done. It will be a work in progress for quite a while. 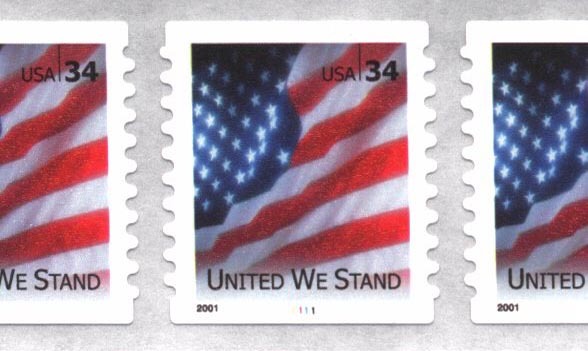 5/16/02 - According to the Bi-weekly Postal Bulletin issued today, all the 37� U.S. Flags and the 3� Star will have their First Day of Issue and nationwide sale on June 7, but several items will not be available for sale on that date. Those not available till later are the PSA coils of the U.S. Flag in rolls of 100 and 3000, Water-Activated rolls of 100 and 10,000 and the 3� Star in rolls of 10,000. All the data bases have been updated with the above information, some minor first day cover price changes and distribution information when available. The first day of the 37� Antique Toys Self-Adhesive coil of 100 with four designs has been changed to July 25 in Rochester, NY. 5/15/02 - We are finally able to offer something that the membership has been requesting for quite a while. I'm speaking of a forum for those who want to post their want lists and trade stamps with other members. We have just added several new forum folders to the PNC3 Delphi area. One of these is the "PNC Want List / Trade Forum" and the other two are discussion forums for "Back Numbers" and "Coil Labels". To access the PNC3 forums, go to the 'PNC3 Membership' bar and then the 'Message Board'. Log-In as a member, for which registration is free, or as a guest. After the log in process, click on any of the messages and that will take you to the Forum headers and you can then read and/or post to the forum of your choice. If you wish, you can go directly to the PNC3 message forum by using http://forums.delphiforums.com/pnc3/messages. 5/11/02 - A new dealer listing has been added to the 'Collecting PNCs' bar. Philatelic Arts, which specializes in Used PNCs also is publishing the second edition, "2002-2003 Guide To Collecting Plate Number Coil Stamps". Details can be found in the 'Reference Section' by clicking on Literature or going to the web site . 5/10/02 - Don Smeraldi, USPS Senior Community Relations Specialist, sent a note that the First Day of Issue for the 37� water-activated Flag coils of 3000 and 10,000 has been moved up to June 7 in Washington, DC because the coils are ready for sale to the public. Self-Adhesive Flag coils of 100, both denominated and non-denominated, denominated S-A coils of 3000 and 10,000, a water-activated coil of 100 and a 3� Star all will have their first day the same date. All associated files have been updated. 5/7/02 - Comparison scans of the back number varieties, and the 'ghost' images on the reprinted Statue of Liberty water-activated coils of 3000 are on the SOL data page. The reprint on British paper has not yet been reported on coils of 10,000. 5/3/02 - The complete 10 year run of Stephen Esrati's PNC publication, "The Plate Number" is now online. This often controversial newsletter contains a wealth of information and technical details, plus in-depth investigative reporting on the stories behind the stamps, with articles by leading philatelic writers and dealers. Click on the 'Reference' bar and go to 'The Plate Number'. 5/3/02 - Technical information on the Data page for the American Toleware stamp has been updated. 5/2/02 - In today's Postal Bulletin, the US Postal Service announced the issuance of a new Self-Adhesive Linerless Coil of 100 for the Christmas mailing season. The Holiday stamps will feature four designs with Snowmen and the issue date, in a city to be determined, will be in mid-October. The announcement was included in the updated 2002 Stamps and Postal Stationery listing for May. More details as they become available. 5/2/02 - A lot on Ebay which closed this morning featured a pair of the 34� Statue of Liberty Self-Adhesive coil stamps with die-cuts omitted. The pair was offered by P & E Stamps of Naugatuck, CT 06770 and came from a partial roll with plate #4444. Click the photo to see the full plate strip. 5/1/02 - Welcome to those who are visiting as a result of the article in Linn's Stamp News. William F. Sharpe, in his 'Stamps on the Internet' column on page 34 of the May 6, 2002 Linns opens with a statement that "Ron Maifeld includes just about everything a plate number coil collector needs..."
Since William visited the site for his article, we have been busy adding to it and within the next week in the 'Reference' section, you will find the full 10 year run of Stephen Esrati's publication, The Plate Number, and shortly thereafter, the list of PNC values, which will be published soon in Linn's. We invite you to consider becoming a member of the Plate Number Coil Collectors Club (PNC3). Membership information, benefits and an application form can be found by clicking on the 'Membership' bar on the left. 5/1/02 - One of the missing links, the Coil Line of October, 1996 has been added online, as was the May 1999 issue. I have 2 more issues of The Plate Number to scan and that will be complete. 4/29/02 - Dr. Robert Rabinowitz has reported the existence of plate 55555 on the 25� non-denominated Self-Adhesive Diner. The new number has been added to the affected files. 4/27/02 - Hope to see you at the Plymouth Stamp Show today. I'll be there for the regional PNC3 meeting at 10:30 am. This is a 'heads-up' of a possible color variety on the 21� Bison coil with plate #2222. This coil apparently exists with the brown in two very different shades, the one a purple brown and the other a red or orange brown. I'll add scans when I get copies of both. 4/23/02 - First Day dates have been announced by the US Postal Service for the stamps listed in the April 5th article below. June 7 in Washington, DC for the non-denominated U. S. Flag and the 3� Make Up Star. No mention was made of the non-denominated Antique Toys previously announced coil of 100, but it probably will be the same place. No ceremony is planned for these issues. July 22 in Washington, DC for the 37� U. S. Flag and the same date in Rochester, NY for the 37� Antique Toys. No ceremony is planned for the Flag coil. 4/19/02 - Tentative data on the 5� American Toleware stamp has been posted. Click on the link. A denominated, water-activated 34� Statue of Liberty 'second printing' variety in coils of 3000 has been found by collectors in Detroit, Michigan and New York City. Other finds have been reported in Riverside, California and Cincinnati, Ohio. The original printing used American made paper, while the second printing uses British paper. On the first printing, the background color leans toward a purplish-blue, but the color difference is not consistent, and the back is bright when viewed with a Long Wave Ultraviolet lamp. The later printing on British paper exhibits a background of a bright blue and the paper under Long Wave light is dead. The original paper is noticeably darker, almost brown, when viewed under either Long Wave or Short Wave light. On the examples I've seen so far, from Detroit and Cincinnati, the greenish-blue dot-matrix back numbers are also different. The original has larger dots which overlap and are almost solid while the reprint shows small dots that create an open appearance to the numbers. For details, see the May issue of Coil Line. A project that started last summer and was announced at the Annual Meeting in Chicago is about to come to fruition. Linns Stamp News has received the database for the PNC Values, which has run in the past as Trends data. We are uncertain at this time when the feature will be in print, but Linns gave a ballpark figure of 4 to 6 weeks. Dave Cockrill compiled the data, as in past years. Concurrent with the publication in print by Linns, the data will be posted to our web site and be available in Excel file format. 4/12/02 - Scans of Coil Line back issues for 1998 thru April of '99 have been added to the 'Reference' section. This brings us up to the 3 year gap prescribed by the club. Still missing are the issues from June till December of 1988 and the lone issue of October, 1996. I'll pick these up at the Plymouth Regional Meeting and scan them on my return home, along with the May 1999 issue. After that, a back issue will be added each month. 4/10/02 - Better than nothing - The attached scan of the 5� Toleware stamp to be issued May 31 is from the Summer 2002 USA Philatelic catalog and is the only picture available so far. The Toleware stamp will be issued at the NAPEX Stamp Show in McLean, Virginia in water-activated coils of 10,000. Plate numbers will be 10 stamps apart, as probably will the back numbers. I'll replace the scan when I get a better one. 4/9/02 - The US Postal Service today released designs for the new rate change stamps listed below in the April 5 item. These are scheduled for release in Washington, DC. The full announcement can be read by clicking here. 4/7/02 - A new page has been added to the 'Reference' section. This is a listing of PNC Philatelic Literature, including Books, Catalogs and Other Publications. If I missed any, please feel free to let me know. 4/6/02 - It was brought to my attention through a phone conversation with a member that some people who come to the web site can not access the site beyond the front page because they do not have the capability to click on links. This happens with those who have web-tv, and perhaps others. The timing was right because I was working on a Site Map where they can access the URLs for the links and type them on their screen. The information is at ../reference/Siteindex.htm. The permanent link is in the 'Reference' bar, or use the link above the red bar at the bottom of the page. 4/5/02 - Here is what we know about the rate change issues at this point. * 3� Star - Date and City TBD - PSA pane of 50 and Gummed coil of 10,000. * 37� Flag (non-denominated) - June - City TBD - PSA coils of 100 and WAG coils of 3,000. * 37� Antique Toys (non-denominated) - June - City TBD - PSA coils of 100. * 37� Flag - July - City TBD - PSA coils of 100 & 10,000 and WAG coils of 3,000 and 10,000. * 37� Antique Toys - Date and City TBD - PSA coils of 100. The USPS is expected to release more details and photos on April 9. 4/4/02 - President Gene Trinks sent word that PNC3 will hold a Regional Meeting at the Plymouth Show in Plymouth, Michigan on Saturday, April 27th, starting at 10:30 AM. The announcement of this meeting did not make it into Coil Line this year, so spread the word to members within reach of the show. The webmaster will be there. Hope you can attend also. 4/3/02 - Scans of Coil Line back issues for 1997 have been added to the 'Reference' section. 4/2/02 - WOW!! - 68 visitors to the website yesterday. Try to attend the online chat tonight at 9 pm (Nine) eastern. Follow the link in the 'Membership' button. 4/1/02 - The results of our PNC3 auction #26 which ended March 23, 2002 are now posted online. All the auction information can be accessed by using the 'Membership' button. Thanks to Auctioneer Joe Sedivy for another successful auction. 1902, 1903, 1905, 1906, 2123, 2124, 2125, 2126, 2127, 2128, 2129, 2130, 2132, 2261, 2280 and 2452a. There were a few minor changes elsewhere, but most of the changes were in the 'Coil Sizes' line. 3/29/02 - Scans of Coil Line back issues are now complete through 1996, except October, in the 'Reference' section. A separate Index file has also been added. 3/28/02 - A prominent PNC dealer has located quantities of the 5� Circus Wagon, insuring that they will be available at a reasonable cost. Donna Rajotte in Providence and Renate Fearonce in Tucson are searching for them to add to their philatelic stock. 3/25/02 - Another member has confirmed the 5� Circus Wagon coil with S3 and the fact it is printed with luminescent red ink. All the affected data bases have been updated with the new number. 3/24/02 - Member Dan Farrar reports that he received on 3/18/02 a stamped solicitation envelope from the DAV that contained three un-numbered 3� Conestoga coil stamps and a strip of five 5� Circus Wagons with plate S3. This is the first report of this number. 3/24/02 - Scans of Coil Line back issues are now complete through 1995 in the 'Reference' section. 3/21/02 - The USPS announced today a long list of stamps being withdrawn from sale on March 31. The list includes many coils which are highlighted in bold. 3/20/02 - Regional PNC3 meeting April 13 at Wilkpex in East Pittsburgh, Pennsylvania. Click here for details. 3/19/02 - Scans of Coil Line back issues are complete through 1993 in the 'Reference' section. 3/11/02 - A list of Non-Denominated stamps, their descriptions and values has been posted in the 'References' section. The information is in Excel format. 3/10/02 - Plate number 3333 on the United We Stand Self-Adhesive coil of 100 has been found. The number is being added to the appropriate data bases. 3/07/02 - Additional scans of Coil Line have been posted through March, 1992. I've tried to find a happy median between file size and loading time. The scans can be found by clicking the 'Reference' bar. To access the back issues of Coil Line, you will need Adobe Acrobat reader, which is free and can be gotten by going to the 'Online Resources' bar. 3/03/02 - New today is a scan of Volume 2, Number 5, the May, 1989 issue of Coil Line in PDF format, which happens to be the first issue I received as a member. As time permits, I'll keep scanning back issues and keep you posted. 2/28/02 - Our 26th PNC3 Auction Closes March 23rd and features 434 lots. Bids can be submitted by mail, emailed or by using our online auction bidding form. See the March 2002 issue of Coil Line for lot descriptions or go to the online Acrobat Auction 26 PDF file. Remember that you must be a member of PNC3 to bid in our auctions. The file, in Adobe Acrobat format, is a scan of the Coil Line pages and may take a while to load. 2/25/02 - Added to the Reference Section is the USPS Master Item Numbers list of coils. Click here or go to the Reference link. 2/24/02 - Bill McMurray wrote to share information on where his exhibit, "Tomorrow's Classics Part II (1982 & 1983 Transportation Coil Issues)", will be showing. See below for locations. Bill invites everyone to stop by and see his exhibit and say hello. 115 New State Road, Manchester, CT.
2/23/02 - Linn's Stamp News reports in its' March 4 edition on page 24 that the 5� American Toleware lick n stick coil of 10,000 will be issued May 31 at the Napex show in McLean, Virginia. USPS spokesman Don Smeraldi stated that the American Toleware coil would replace the 5� Circus Wagon coils. 2/23/02 - Julian Jakubson called my attention to a slight measurement discrepancy on the 17� Precanceled Auto coil. The figures have been changed on the data page and the comparison page. 2/22/02 - Donna Rajotte reports the following now in stock in Providence. 34� Statue of Liberty PSA 100 plate number 6666 every 24 stamps, USPS item number 771300 and 34� United We Stand PSA 100 plate number 2222 every 24 stamps, USPS item number 779100. Contact Donna through the web site at www.usps.gov/provdist/ and click on Philatelic Phinds. 2/20/02 - The United States Postal Service announced in the Postal Bulletin of February 7 that a new gummed 5� coil of 10,000 with an American Toleware subject will be issued sometime later this year. The item number will be 778100. No other details were given. 2/05/02 - This will be the last item for two weeks, unless John has something to post. I'm off to California to visit my children and grandkids and to spend some time at the APS Winter Show. 2/01/02 - There will be Regional PNC3 meetings in each of the next three weekends. A meeting tomorrow will be held in conjunction with the Sarasota National Stamp Exhibition. Next week, on the 9th, there will be a meeting at the APS Winter Show in Riverside, California. The following weekend, on February 16, AIRPEX in Mesa, Arizona will host a regional meeting. More information can be found by clicking the 'PNC3 Membership' bar on the left and going to Regional Meetings. I'll be at the APS Winter Show and hope to see you there. 2/01/02 - Member Dan Forgues wrote to report his discovery of an 18� Surrey #17 with a Purple Machine Cancel. His original report was published in Coil Line last year. The number has been added to the 18� Surrey data page. A complete list of Purple Machine Cancels on PNCs can be found by clicking the 'Reference' bar on the left. 1/27/02 - John Cropper has added selected scans of roll labels for 18� Flag, 2� Locomotive, 9.3� Mail Wagon, 18� Surrey, 5� Canoe and 29� Flag and White House issues. Anyone wanting to contribute scans (150 dpi) or submit material to be scanned and added to the web site should contact Ron or John. 1/19/02 - Our data bases can now be downloaded and printed in both Microsoft Works and Excel formats. Access both through the PNC Master List on the PNC Data bar on the left. Please notify the Webmaster if you encounter any problems. 1/16/02 - In his column, Stamps On The Net, in the January 28, 2002 issue of Stamp Collector, Kim Frankenhoff spotlights one of our members and his web site. Featured is Roland Klinger of Niederkassel, Germany and his extensive "Flag Over Porch" web site. The PNC3 web site is also mentioned in the article along with a site authored by Robin Harris. Both Rolands' and Robins' sites can be accessed by clicking on the 'Online Resources' bar on the left, then clicking 'collectors'. 1/14/02 - Scott Publishing Company has assigned catalog #3550A to the 34� United We Stand Self-Adhesive Coil of 10,000. 1/13/02 - The United We Stand SA Coil of 100 with plate number 2222 has been found in Northern New Jersey. Number 4444 on the 1� Kestrel can be found in the vending machine at the Alhambra, CA main office, Bay Street and Garfield Blvd. Centering is reported to be Very Good. 1/13/02 - The Providence Philatelic Web Site has been added to the "Online Resources" menu bar on the left. 1/10/02 - Donna Rajotte, the Providence, RI Internet Philatelic Clerk reports that she has the 34� United We Stand PSA coil of 10,000 in stock with plate number 1111 every 21 stamps. There are top/bottom aqua back numbers every 20 stamps and 420 stamps are needed for a # on # hit. Donna has the Providence Philatelic Inventory online. Go to Providence and then click 'Philatelic Finds'. 1/6/02 - Coil size data has been added to Scott #1895, the 20� Flag over Supreme Court. 1/5/02 - Plate number 2222 has been reported on the United We Stand SA Coil of 100. A new number 4444, has been reported on the 1� Kestrel. All associated lists have been updated. 1/02/02 - Scan added to the data sheet for the 34� United We Stand Self-Adhesive Coil of 10,000. A note was added to both the coil of 100 and the 10,000 about the corner differences. Scott catalog will assign different numbers because of the corner differences. 1/02/02 - Frank Nemeth pointed out a couple of inconsistencies with the listings of Scott 1895, the 20� Flag over Supreme Court. All the data has been changed to read: 1895 - (wide block tag) #1, 2, 3, 5, 11, 13 and 14; 1895c - (untagged) #4, 5, 8, 9, 10, 11 and 14. 1/01/02 - A list of PNC3 Officers and Committees has been added to the PNC3 Membership Bar on the left.